If there ever was a week for a warm, soothing, cleansing sort of soup this would be it. After all that Thanksgiving feasting my tummy needed soup. You can make it spicy. I did, you know I can’t resist. It can be low calorie. I did use Lite Coconut Milk. It was already in my pantry. And I like my skinny jeans. You don’t even have to include the garbanzo beans if you don’t like them. Place lentils in colander and rinse well. Place in large stockpot and cover with water by 1 inch. Bring to boil, then reduce to simmer and cook until tender, approx 20-25mins. In the meantime in large skillet add olive oil and onion, red pepper, celery and carrots. Cook until soft, about 4-5 mins. Add garlic and ginger, continue to cook 2 mins more. Add red curry paste and sugar, stir to incorporate. Now add tomatoes, garbanzo beans, cooked lentils and coconut milk. 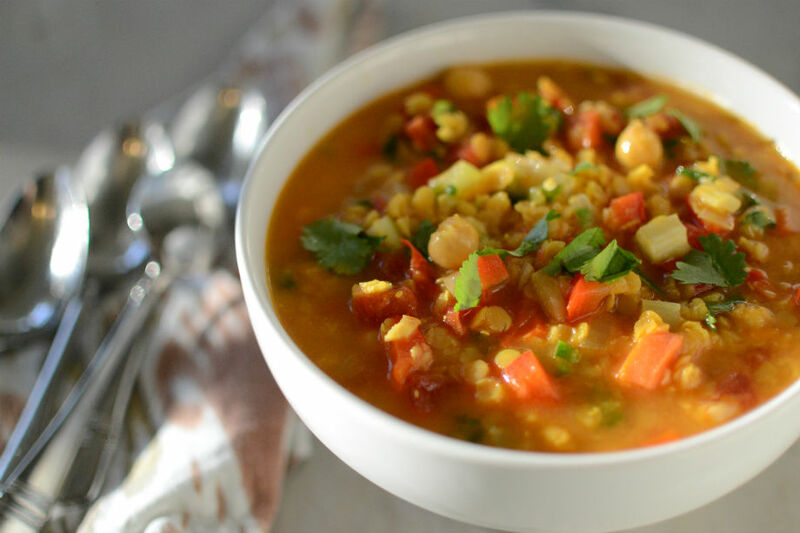 Ladle into warm bowls, squeeze some lime over each bowl and top with scallions and cilantro.